The youth ministry provides students with a better way to live; by teaching them to live for Christ. We plan activities to promote the purpose and plan God has for every Christian teenager: to know Him (John 17:3), to serve Him and to make His name known. The New Hope Youth Ministry is comprised of young people, ages 13-18, who love to praise God in various ways. They serve in many areas: Step, Mime, Praise Dance, Media, Children’s Ministry, Usher Ministry and Greeters Ministry, just to name a few. The teens hold their monthly meeting on the 3rd Sunday of each month during the continental breakfast hour (9:00 a.m.). The Youth Ministry continues to support the communities we live in by participating in community events such as: Canton International Festival, Canton Liberty Festival and the Romulus Pumpkin Festival. What is Praise Dancing? It is a physical expression of worship. It allows the congregation to see a connection between body movement and spirit. 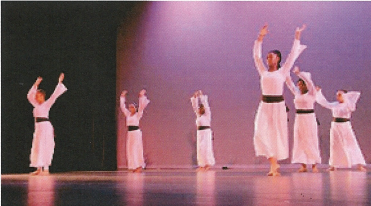 The purpose of the dance is to deepen the religious experience. The dance can express many aspects of worship: Praise where the dancers are offering thanksgiving; Worship when intimacy between the performers would be expressed through reverent, yielding movements. There are celebratory dances and those expressing the fight against evil which would be forceful, bold and full of confidence. Expressing suffering and trouble would suggest movements conveying reaching out to God for help, guidance, direction and relief. Rehearsal Schedule: Tuesdays & Thursdays 6:00 p.m. – 8:00 p.m.
What is ‘MIME’? Mime is the art of silence. Mime also takes the INVISIBLE and makes it VISIBLE, the ORDINARY become EXTRA-ORDINARY. 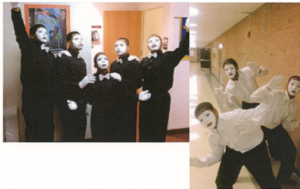 How is Mime different from dance? The word ‘mime’ is derived from the word ‘mimic’ meaning ‘to imitate or copy’. Mime is the imitation, the copy of life! Not dancing! What is Stepping? “Stepping” is a historical form of communication and storytelling that is widely performed by fraternities and sororities and now churches. Stepping is partly rooted in the experience of African-American men working on the railroad. To keep up their morale and esteem and to forget about the pain, they stepped. It was a tune that they marched to, a tune about a story and pain. Step served as a sort of code for African Americans to tell their story since speaking out was often times too dangerous. Since then it has grown and evolved. Today’s steppers often add hip-hop movements. Youth Weekend is held annually in February. This weekend allows the youth to gather together, fellowship, serve and lead worship services. Each year New Hope sponsors college tours to expose students to college and university life, campus culture and academic requirements.